Maintaining the right amount of moisture content in fertilisers is very important to the grading and quality of the fertilisers. Issues can arise if the final product is either too wet or too dry and can lead to significant product quality issues. Always looking to improve their processes, Neutrog – an organic fertiliser manufacturer based in South Australia, contacted A&D Weighing. 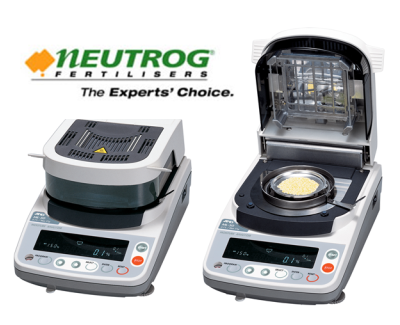 To start, a small sample from Neutrog’s production was collected and some preliminary tests were conducted by A&D Weighing Moisture Balance on these samples. The results of these tests and real-time graphing displays were then shared with Neutrog. Based on the results of the preliminary tests, Neutrog purchased the A&D ML-50 moisture analyser, and are now able to analyse their organic products quickly and effectively, producing superior quality products. A&D Weighing is an Australian leader in the supply of electronic weighing scales, balances, metal detectors, checkweighers and analytical equipment. Browse our website to view our full range of weighing equipment, as well as many other products and services or contact us on 1800 241 343 today.